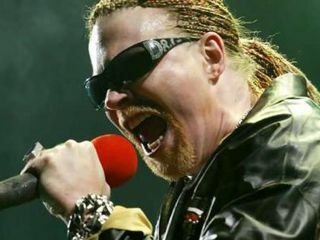 Axl Rose plays in a rock band, but apparently he also plays Rock Band. Or at least he realizes the video game's growing importance in reaching music fans - it has just been announced that Shackler's Revenge, a track from the endlessly delayed Guns N' Roses album Chinese Democracy, will appear in Rock Band 2 in September. The inclusion of the track is noteworthy for two reasons: by showcasing an unreleased track from an eagerly awaited album by a superstar act such as Guns N' Roses, it underscores how important to the music business games have become; also, it gives strong indication that Chinese Democracy might finally see the light of day, possibly this fall. The last full album credited to Guns N' Roses, The Spaghetti Incident?, was released in 1993. Rock Band is developed by Harmonix Music Systems and published by MTV Games, and like its main competitor Guitar Hero, it has been something of a godsend for older bands looking to reach younger music fans and game enthusiasts. "These games absolutely have an impact because the opportunity to hear these songs on radio is dwindling," said Mike Davis, executive vice president and general manager of Universal Music Enterprises. "This is becoming an important piece of the marketing puzzle." "These games absolutely have an impact because the opportunity to hear these songs on radio is dwindling." MTV and Universal Music Group, Guns N' Roses's label, declined to comment on the just-announced GN'R deal. MusicRadar has a game idea for them, however: a ouiji board. Kind of old school, but here's the deal: players can contact members of Guns N' Roses, past and present, at a seance. Maybe then we can get to the bottom of Chinese Democracy's release. Perhaps we can get the old band back together too.